The Albanian Policewoman Ina Nuka, injured in the protest organized in front of the Albanian Parliament was sent to Turkey for specialized medical treatment. She was accompanied by Albania's Interior Minister Sandër Lleshaj at Mother Teresa International Airport in Rinas, Albania's Minister of Health and Social Protection Orgeta Manastirliu, the Turkish Embassy functionary in charge, Muammer Hakan Cengiz, and her family. Minister Lleshaj, in a statement to Turkish AA agency, said the Turkish government made it possible to send her to Turkey very quickly. "We followed yesterday the injured police officer in the Republic of Turkey, and great thanks to the Government of Turkey, which made it possible for her to go to Turkey in a very short time, and I hope that the medical treatment goes well. We hope that there will be a good treatment and a good result," said Minister Lleshaj. 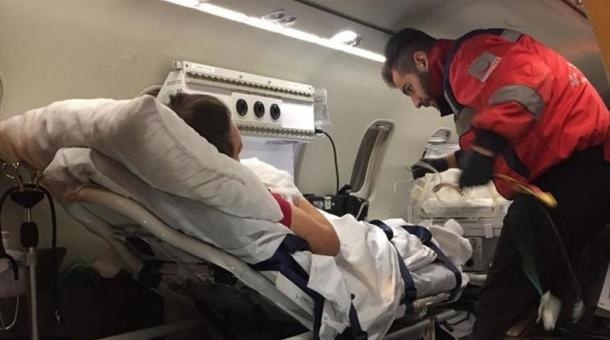 While Muammer Hakan Cengiz said that the injured Albanian Police officer was headed to Ankara with a special medical plane of the Ministry of Health of the Republic of Turkey. "At the request of the Prime Minister of Albania, Edi Rama and with the directive of our President (Erdogan), Ina Nuka has gone to medical treatment in Turkey and will be treated at the Special Treatment Hospital in Ankara...Turkey will definitely be always close to the friend and brother country of Albania. We will continue to give our support in such special cases." Said the representative of the Turkish Embassy in Tirana, Muammer Hakan Cengiz.